Govt Order MEMO. NO.HMB(B)19/2015/pt Dtd. Itanagar the 26th July, 2018 issued by the competent authority(Home Department), Govt. 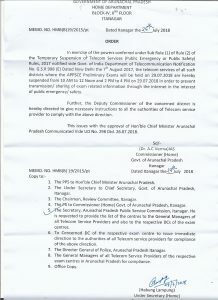 of arunachal pradesh suspending telecom services on 29/07/2018 from 10 AM to 12 Noon and 2 PM to 4 PM.